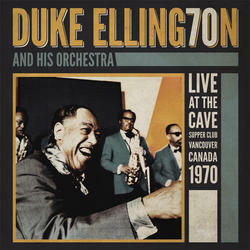 Back in 1970, Duke Ellington was at the threshold of a new sound. Yet again like so many times before, he was to take in his surroundings, musically and otherwise, and bring forth a new style for his musical instrument, his Famous Orchestra. Billy Strayhorn, his writing and arranging companion was now dead, and the bulk of the writing was once again falling on Ellington's shoulders. Hammond Organ pioneer Wild Bill Davis took up some of the slack, as he became Duke's assistant arranger, but Ellington seems to know at this point, that pushing his own limits was needed. This outing documents the final days of star saxophonist Johnny Hodges. The setting is the Cave Theatre Restaurant in Vancouver, B.C. in Canada, and the feeling is warm and intimate, but there is a decided edge to the feel of the music. The exotic power of drummer Rufus Jones is making a mark, and Ellington is about to bring us on his final journey through "The Jungle" once again.